In a sign that the Elk Grove mayoral race is heating up, a sign was posted today at one of Elk Grove's monument billboards located on Highway 99. 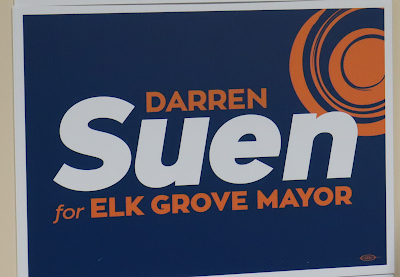 The sign, which is in support of Darren Suen, who is one of three of candidates seeking the two-year office. Suen, who is the city's current vice mayor, and Tracie Stafford, are challenging incumbent Steve Ly. Placement of the sign was coordinated by Suen's Elk Grove city council colleague, Council Member Steve Detrick, and the owner of the monument billboard, Gil Moore, donated the space and installation. Detrick said the bannersign is classified as an in-kind donation From The Sign Center and the appropriate documentation has been submitted to the Suen campaign (see video below). Suen has the endorsements of Detrick and the two other council members, Pat Hume, and Stephanie Nguyen. In addition to coordinating this in-kind donation, last month Detrick made a $5,000 contribution to Suen from his campaign funds. "I have always thought that this would be a great location for a campaign sign with thousands of vehicle driving by," Detrick said. 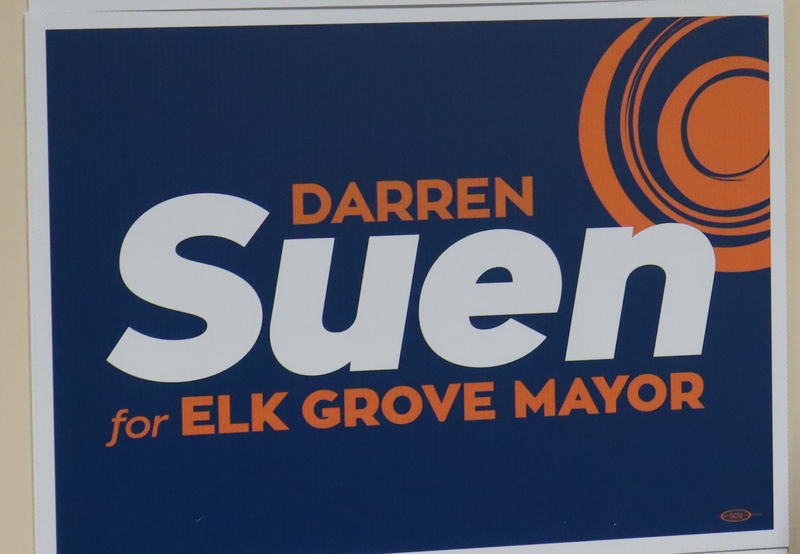 "Both Gil Moore and The Sign Center (who produced the sign) wanted to sponsor the sign as supporters of Darren Suen for mayor." Detrick noted the generous support of Moore and The Sign Center adding that it indicates "a real testimony of the broad support for Darren Suen for mayor." Confucius say, "man with tall sign have hungry ego".